1. Make sure there are no bones in the salmon pieces. Lightly process them (4-6 pulses). If you over pulse then you will end up with a salmon paste instead of the finely minced salmon. Do it in a couple batches to make sure you don’t over pulse. 2. Combine the minced salmon, 1/4 c of the breadcrumbs, coconut milk, onion, parsley, and salt in a bowl. Form into patties and freeze for 15 minutes or until firm. 3. Take three shallow bowls. Put the flour in one, beaten eggs in the second, and breadcrumbs in the third. Dredge the salmon patties in the flour, then egg, then breadcrumbs. Place in frying pan with olive oil and sprinkle Parmesan cheese on top of each cake. Cook on medium heat for 4-6 minutes on each side. We all enjoyed the salmon cakes…yes, even the kiddos. 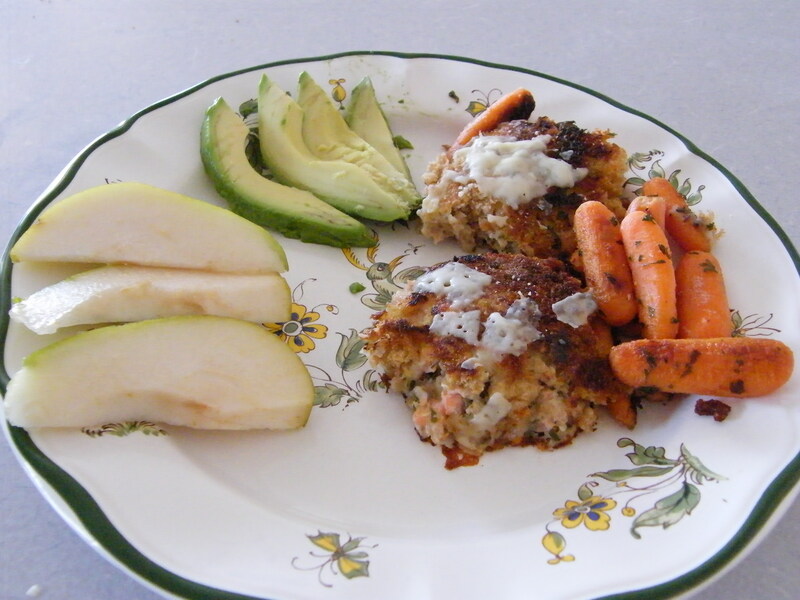 We ate our salmon cakes with avocado slices, pears, and carrots.